Toss out your fleet of backpacks for the Osprey Aether 70 Backpack, because it can do everything your old packs do, and more. 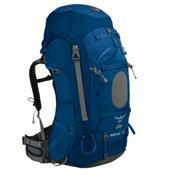 Weekend backpack trips, ski tours, and even mountain climbing are all possible with this moderately sized pack. If your weeklong trip to the Andes requires a little more gear, take advantage of the AddOn feature that lets you attach a daypack, crampon pocket, or other pieces (sold separately) to the front of the Aether 70 using built-in cord loops.